Though the naming and numbering of the year is a somewhat cultural thing, varying from place to place over the centuries, it is all based on the cycles of movement of sun, moon and other celestial bodies. Time is measured by these movements and how they relate to our experience here on Earth. We have combined these cycles: terrestrial, celestial, astrological and runic with other correspondences in a new way and we have found that every day of the year has its own clear energy signature. Our birth day gives us a set of habits, tendencies and ways of doing things that weaves through all our personal experiences of life. It gives us our strengths and weaknesses that complement, moderate or augment the more familiar astrological profiles of our birth chart. 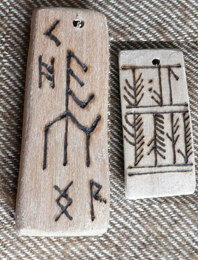 So what we offer here is a nice wooden talisman decorated with a bindrune, a combination of runes that embody the energies of your own day of birth. Together with this design are other runes that further enhance and balance these energies, to help you to make the best use of your birth day's potential. Because there are 366 rune combinations it is not practical to have them all in stock (! ), so each talisman pendant will be made when you order. Together with your Birthday Rune pendant will come a printed explanation of your birth day energies. This is available nowhere else (unless you can read Japanese!) and is extracted from our book, recently published by NEMS, Tokyo - (The Power of Birthday, Runes and Stars; The Complete Personology Guide) - which is the product of several year's intense research and writing. ( We can guarantee you will find new insights into your personality that will make it much easier to manifest your natural, unique talents! Please remember to let us know your date and month of birth.